Laughing Cow Cheese is found in the dairy case with other cheeses. It comes as a wheel of 8 individual wedges. As usual, garlic is optional. 1. In a small saucepan, bring the first 6 ingredients, water thru cayenne pepper, to a boil. 2. Gradually stir in the grits, then reduce the heat, cover, and simmer 5 minutes, stirring occasionally. 3. Add 1 wedge of the cheese and the garlic, stirring well, and remove from heat. 5. Let the grits cool uncovered for 10 minutes, stirring occasionally. Stir in 1 of the eggs. Pour the mixture into a lightly greased 1 1.2 quart baking dish. I use a glass loaf pan. 6. Bake the grits crust for 20 – 25 minutes, or until set but still a bit jiggley. 7. Meanwhile, stir together the remaining 3 eggs and 1/4 cup milk with an additional 1/4 tsp salt and 1/8 tsp pepper. With a sharp paring knife, cut the remaining cheese wedges into small pieces. 8. 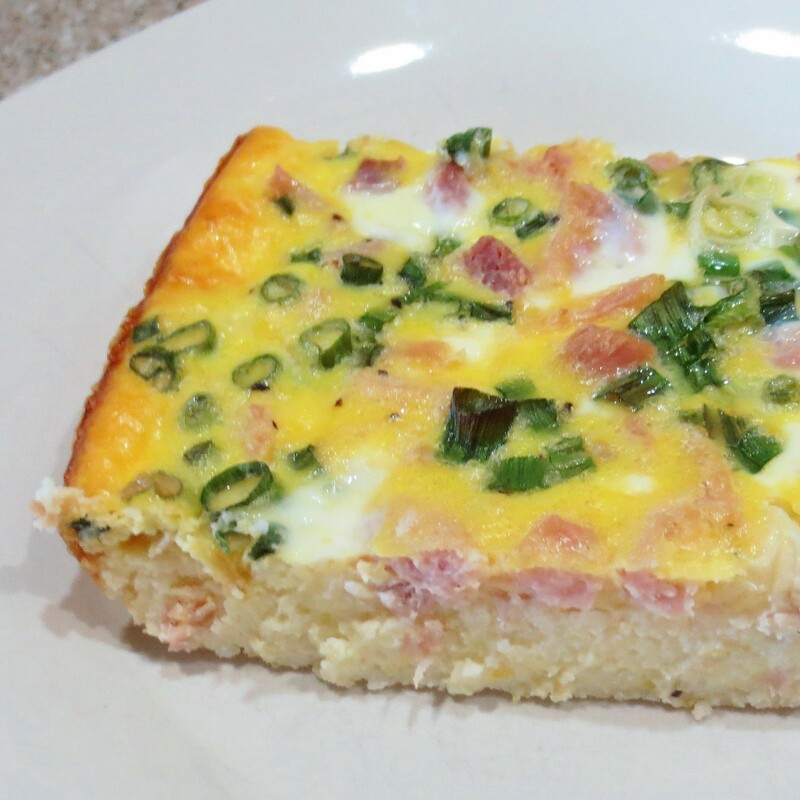 Remove the crust from the oven and sprinkle evenly with the remaining cheese, then the ham and green onions. Gently pour the egg mixture over the top and return the casserole to the oven. 9. Bake for an additional 25 to 35 minutes, or until just set. 10. Cool, loosely covered with foil, for 10 minutes before cutting into squares to serve.